Commercial aviation students at UND’s John D. Odegard School of Aerospace Sciences have seats waiting for them in the cockpit of industry-leading airline, United Airlines. The UND Career Pathway Program (CPP) with United, announced Monday, offers defined steps for aviation students to become United Airlines pilots, as long as they continue to meet a set of University and airline eligibility requirements. 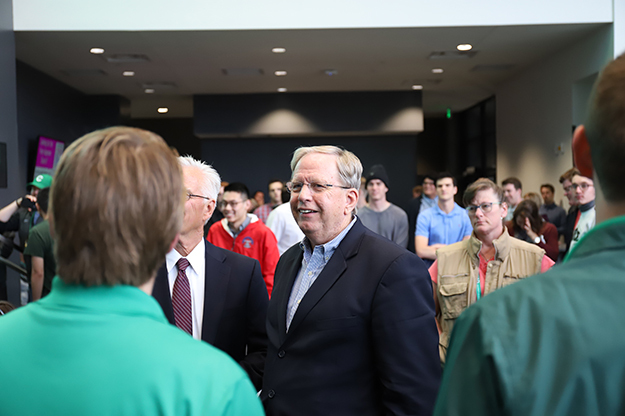 The announcement was made jointly by UND Aerospace officials and United Airlines and UND Aerospace officials before about 350 prospective students and their parents during a student orientation event at Robin Hall on campus. The program is slated to kick off at UND in the fall. Such agreements help address the continued need for new pilots and create an additional pipeline for well-trained United pilots. Eligible UND aviation students, in turn, benefit from clear and reliable pathways to the flight decks of United Airlines and its regional partners. “The United career path program helps enable us to operate our fleet efficiently and continue to provide our customers with a safe and reliable travel experience. Additionally, it offers talented students like the ones at the University of North Dakota with the opportunity to be a part of a great team at a global airline that is focused on putting the customer at the center of everything we do,” said Captain Mike McCasky, Managing Director-Flight Training of United Airlines. And because the program encourages more experienced student-pilots to serve as instructors, it helps UND meet the training demands of the next crop of aspiring pilots. United Airlines Capt. Mike McCasky, managing director-flight training, addresses about 350 prospective UND students and their parents during and orientation event held Monday at UND’s Robin Hall. Photo by Connor Murphy/UND Today. Once a UND student is accepted into the CPP, no further structured interview is required with United Airlines. As long as United Airlines is hiring pilots, UND students who maintain eligibility would be offered conditional employment with the airline. Applicants must be full-time students with at least two semesters in UND’s Professional Flight Program. They must have a commercial pilot certificate and instrument rating, and maintain a 3.0 grade-point average in Profession Flight Program coursework. UND students also must receive a written recommendation for the program from a Department of Aviation faculty member. Each participating United Express partner has its own CPP requirements that traditional-track pilots would have to meet to be considered for job openings with United Airlines. CPP pilots who continue to meet program criteria at the regional level eventually would be placed in United Airlines’ first available new hire class. Representatives from four United Express regional partners participated in Monday’s announcement, and answered questions from students and parents about their respective airlines. The United Express regional partners in attendance were CommutAir, Express Jet Airlines, Mesa Airlines and Air Wisconsin. 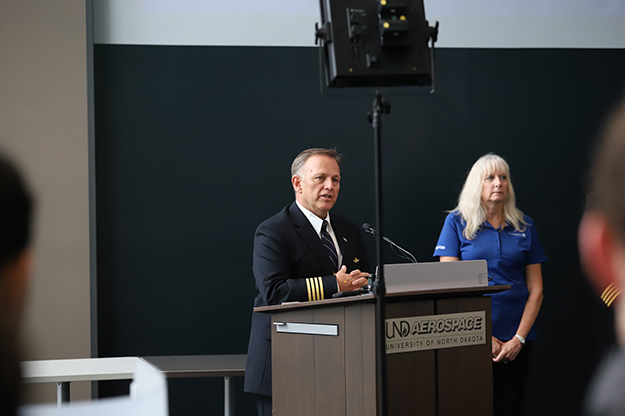 UND Aerospace Dean Paul Lindseth said the new agreement with United Airlines provide defined paths for UND student-pilots to the cockpits of United Airlines and regional aviation partners. It also helps address a flight instructor shortage that’s being caused by increases in aviation student enrollments at UND. Photo by Connor Murphy/UND Today. United Airlines and United Express operate approximately 4,600 flights a day to 354 airports across five continents. In 2017, United and United Express operated more than 1.6 million flights carrying more than 148 million customers. United is proud to have the world’s most comprehensive route network, including U.S. mainland hubs in Chicago, Denver, Houston, Los Angeles, Newark/New York, San Francisco and Washington, D.C. United operates 750 mainline aircraft and the airline’s United Express carriers operate 545 regional aircraft. The airline is a founding member of Star Alliance, which provides service to 191 countries via 28 member airlines. For more information, visit united.com, follow @United on Twitter or connect on Facebook. The common stock of United’s parent, United Continental Holdings, Inc., is traded on the NYSE under the symbol “UAL”.